Lupo Verde alums offer a taste of their native Italy with “neo-Neapolitan” pizzas, fritti, and crudi. 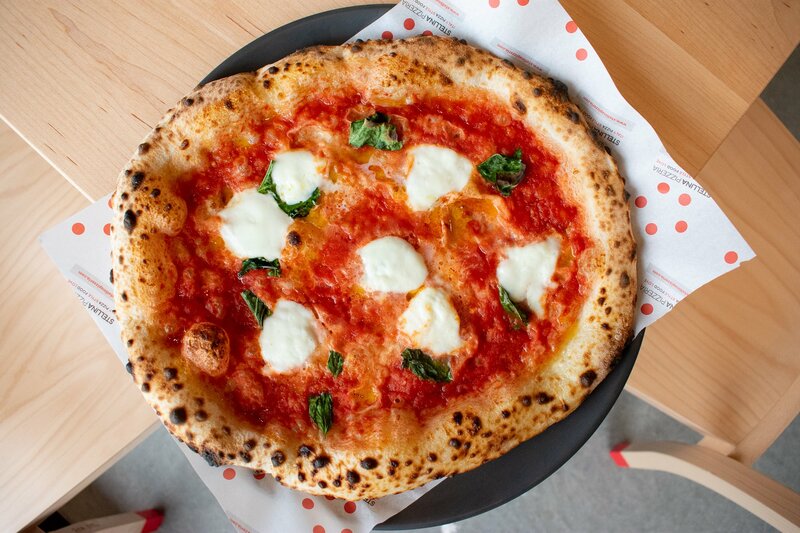 Margarita pizza and cacio e pepe pizza is made in the neo-Neapolitan style. Photograph by Meaghan Webster. 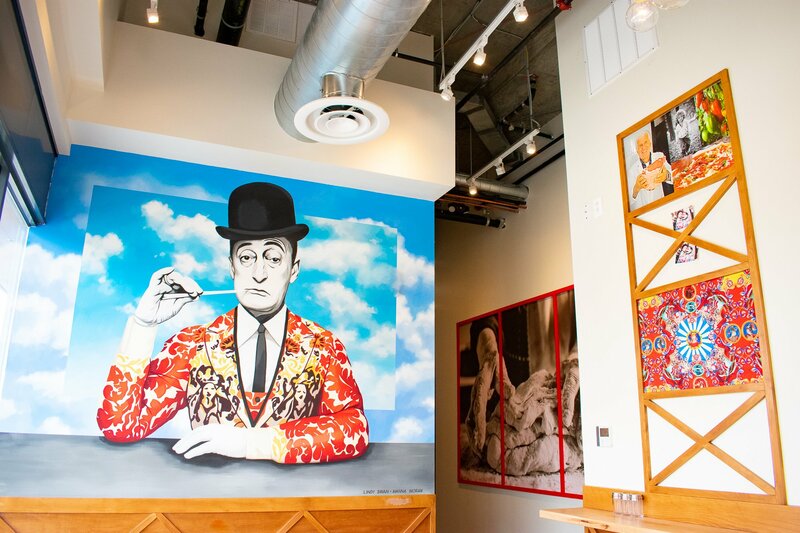 The duo are alums of the finer-dining Lupo group; Matarazzo was a managing partner and Venini the chef for Lupo Verde, Lupo Verde Osteria, and Lupo Marino. Although the 88-seat pizzeria is fast-casual in format, the menu goes far beyond your average pie shop—think tuna crudo with pickled shallots or a crispy octopus and burrata sandwich with escarole, black olives, and chickpea puree. 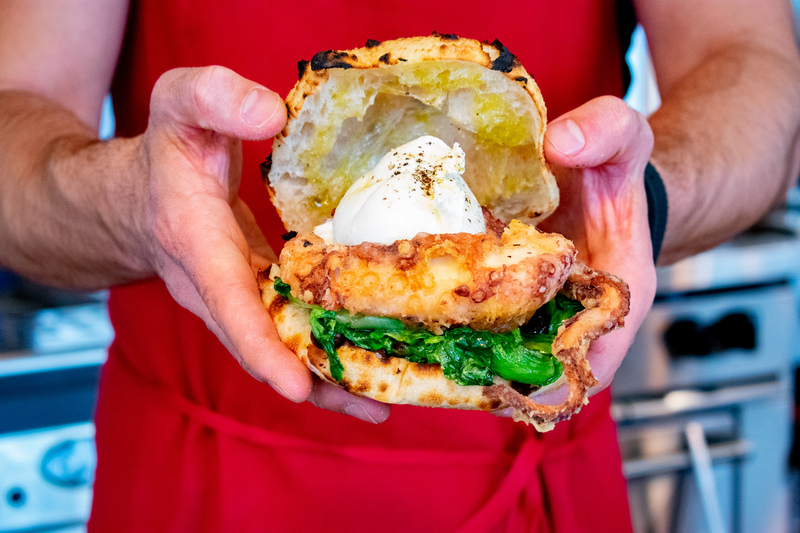 The fried octopus, burrata, and black olive sandwich nods to an appetizer at Lupo Verde. Photograph by Meaghan Webster. Many of the dishes are culled from trips Matarazzo and Venini each took with their families growing up in Italy. Matarazzo is from Avellino, a town near the Amalfi Coast, while Venini is from Lake Como in the north. To prepare for the southern-leaning restaurant, Venini traveled to Puglia to taste his way through tiny shops specializing in fried seafood and spritzes (rough life, no?). The journey inspired a lineup of “cuoppo” appetizers where ingredients like calamari, shrimp, cod, or artichokes are flash fried and served in paper cones. 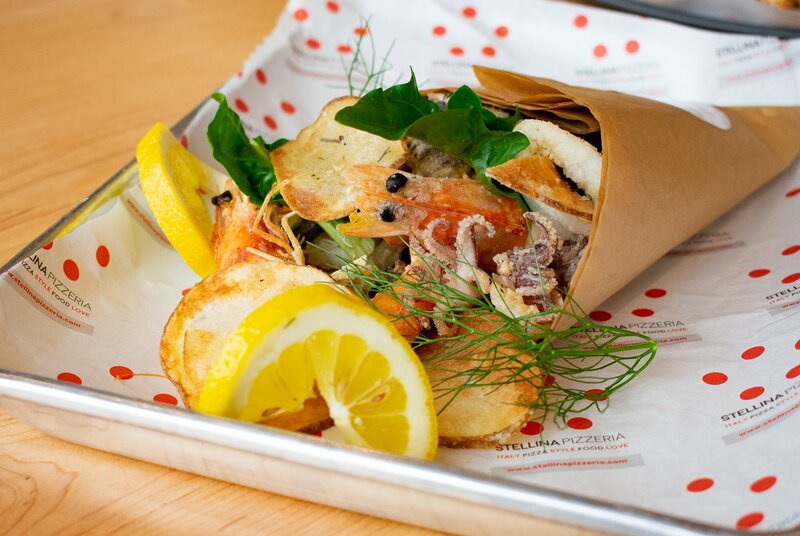 Seafood fritto misto is served in a paper cuoppo, inspired by Venini’s trip to Puglia. Photograph by Meaghan Webster. There were also research trips to Naples. While Stellina’s pizza uses the same ingredients as the city’s classic pies, their “neo-Neapolitan” version is designed with a crisper crust. The dough is fermented for 48 hours before it slides into the Marra Forni oven. Toppings range from a simple margherita—the sauce is just tomatoes and salt blitzed in a blender—to pies that nod to Venini’s northern roots, such as the lardo-and-bresaola pizza (charcuterie is popular in the region, and the meats are topped with arugula and drizzled with black pepper honey). Mozzarella, tomato, and basil top the classic Margarita pizza. Photograph by Meaghan Webster. The chef’s favorite pizza is the cacio e pepe, a riff on the popular Roman pasta dish. He freshly grinds pepper with a mortar and pestle to retain the spice’s powerful flavor. The traditional version is one of three pastas, including a meat ragu and chitarra with seafood. 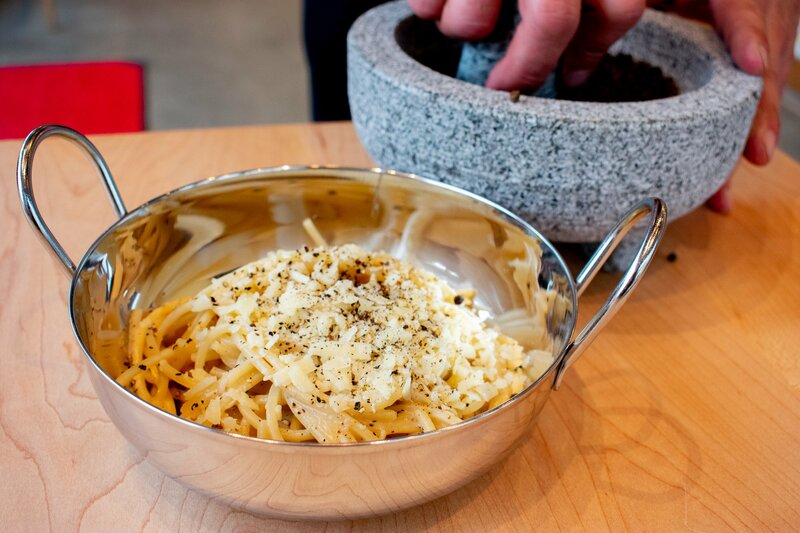 Cacio e pepe is one of three pastas on the menu. The pepper is ground with a mortar and pestle. Photograph by Meaghan Webster. Match a meal with wines by the glass, all under $10. The cocktail menu was designed by Franceso Amodeo of Don Ciccio & Figli distillery in Ivy City (opening soon). His concoctions range from a classic Negroni to the Totò, a mix of vodka and mandarin liqueur named after the famous Italian comedian (his likeness is painted on the wall donning a Dolce & Gabbana suit jacket from the designers’ 2018 collection). A painting of Italian comedian Totò in a Dolce & Gabbana jacket adorns the wall. Photograph by Meaghan Webster. The restaurant is currently open for sit-down dining, takeout, and delivery. The team is also planning on unrolling a series of pasta meal kits and imported Italian products for customers to take home. 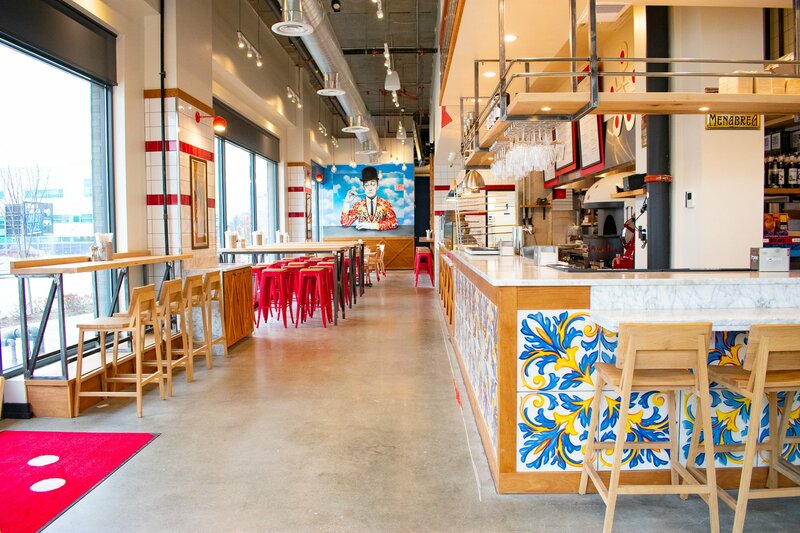 The red and white decor is reminiscent of pizzerias in Naples while the blue and yellow tiling calls to Matarazzo’s connection to the Amalfi Coast. Photograph by Meaghan Webster.